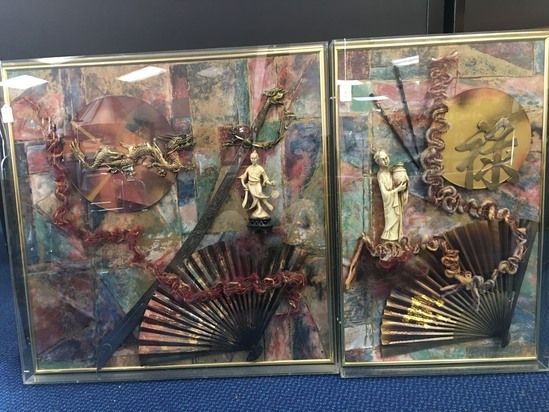 This showroom auction contains fantastic Asian Motif Shadowboxes, Asian Motif Artwork, Marble Body Lamps, Ornate Antique Arm Chair, Vintage and Contemporary Comic Books and MORE! Checkout Date & Times: Please be on time for this auction pickup at 3207 Wade Hampton Blvd., Taylors, SC, 29687 on Friday, April 19th from 11am - 2pm Bring packing material. WHAM will provide movers during the pick-up time only. Purchased at St. James Court Art Show in Louisville KY. in Shadowbox w/ Brass Frame/Matt, 32 3/4" sq. Purchased at St. James Court Art Show in Louisville KY. in Shadow Box w/ Brass Frame/Matt, 20 3/4" x 32 3/4"
You've been outbid to P****g! to YOU!